The Met Office has announced the first named storm of autumn 2016: Storm Angus. 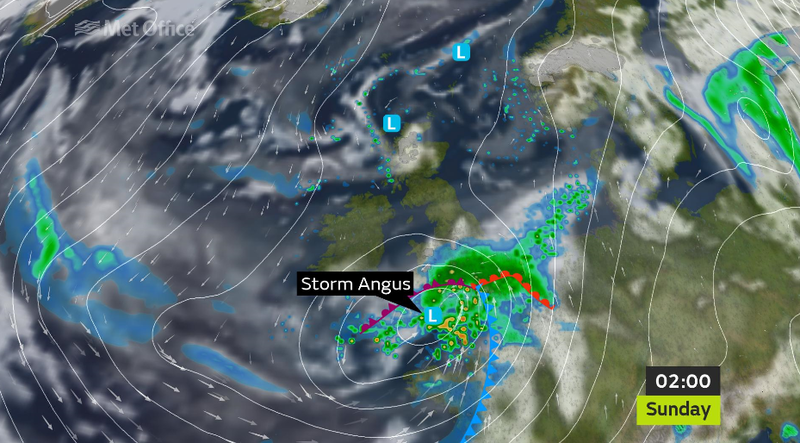 Storm Angus is expected to sweep through south-eastern England bringing some very strong south-westerly winds and heavy rain to affected parts through Sunday morning. Looking at the development of the low-pressure system, on Friday morning the Met Office issued a Yellow warning for Sunday morning for strong winds and heavy rain, from Dorset to Suffolk. But at 10.45am on Saturday Met Office forecasters issued an upgraded Amber warning for severe gales for a stretch of south-eastern England from the Isle of Wight to Kent. The issuing of the Amber warning has triggered the naming of Storm Angus. The Met Office, which is warning that gusts of 70-80 mph are possible in exposed coastal locations within the Amber warning area, is advising there will be likely disruption to transport and power supplies and some damage to buildings. Angus is the first named storm of autumn 2016. The Name Our Storms programme is co-ordinated by the Met Office and Met Éireann, the Irish met service. A pilot project began last year, and Storm Angus marks the first storm of the second year of the project. This entry was posted in Met Office News and tagged Amber warning, Name our storms, National Severe Weather Warning Service. Bookmark the permalink.